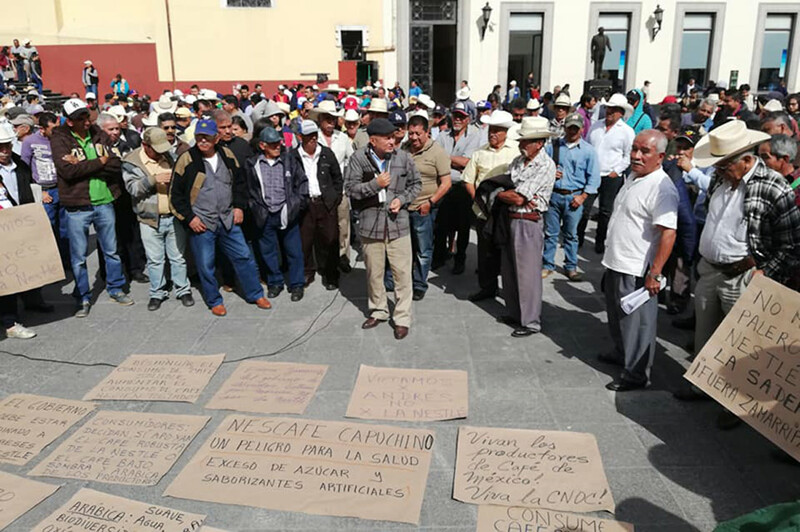 Small-scale coffee farmers took to the streets to stand up for their livelihoods this month as a dispute escalates with the Mexican government. The dispute hinges on who gets the government’s support: the nation’s 500,000+ small-scale coffee farmers or Nestle, the world’s second-largest food and beverage company. In December, Nestle announced plans to build a massive $154-million-dollar coffee processing plant in the Mexican state of Veracruz. The plant would process Robusta coffee, a variety of coffee that commonly goes into instant coffee and cheaper blends (think Nescafe, for example). Much of the world’s supply of Robusta is grown in Brazil and Vietnam at lower elevations than the high mountain Arabica coffee that dominates Mexico’s coffee industry. To support this plant, Nestle is asking the government to subsidize the planting of 80,000 hectares of Robusta, a volume that would make Mexico rival Brazil in coffee production. Such an investment would dramatically change the face of Mexico’s coffee industry. For many years, Mexico was one of the top producers of organic and fair trade coffee and still the coffee industry there is dominated by small-scale coffee farmers whose families tend small diverse plots of land in the mountains. Robusta variety coffee, by contrast, is generally farmed on in large plantations where full sun and monoculture plantings mean heavy chemical fertilizer use. This proposal comes at a particularly bad time for coffee farmers around the globe. While Nestle reported $7.3 billion dollars in profit last year, coffee farmers are seeing prices hit historic lows, hovering around $1/pound on the commodity market for much of 2018. These low prices come as many farmers are already struggling with the impacts of climate change. Irregular weather patterns mean increased drought and unseasonable rain washing away hillsides or damaging blossoms, and making plants more susceptible to fungal diseases like la roya. All these pressures drive down yields and quality—and these pressures have been building over the past half-decade or more. In Mexico, coffee farmers are facing all these challenges, and some additional ones too. While their new president, Andres Manuel Lopez-Obrador (often shortened to AMLO) was elected in part on a platform of standing up for small-scale farmers and rural people and speaking out against neoliberalism, so far his administration has not followed through. Instead, the latest budget slashes funding for the coffee sector, support that is vital for a sector that’s largely made up of small-scale, often indigenous farmers. Pulling support from small-scale farmers and funneling it to corporate interests is a pattern that is, unfortunately, far too familiar. And the complaints that coffee producers raised as they took to the streets in Veracruz sound familiar as well. While government officials promote the coffee processing plant as a potential source of jobs and growth for the region, farmer groups are skeptical. Nestle’s press release promises 250 new jobs and the potential to create up to 1200 jobs in the region. Yet this sort of investment only serves to further concentrate wealth and vertical integration in an industry that continues to consolidate. According to the 2018 Coffee Barometer study, “Only 10% of the aggregate wealth of coffee stays in the producing countries,” and this extraction of wealth is noted as an obstacle to a sustainable coffee sector as well as economic development for coffee producers. The Coordinadora Nacional de Organizaciones Cafetaleras (CNOC), the National Coalition of Coffee Organizations, has expressed concern that this will drive prices down for coffee farmers and push the market further towards low-quality instant coffee. Instead, they argue, the government should be supporting the growth of domestic coffee markets, allowing Mexican farmers to keep more of the value of their crop in the country. Channeling this investment to Nestle is supporting the wrong kind of farming. An expansion of Robusta coffee planting has the potential to drive land grabs to build the massive plantations needed, fueling deforestation and squeezing out small-scale diverse farmers. There’s plenty of evidence that coffee farms, when planted with a diversity of trees and well-managed, can help sequester carbon and combat climate change. But that’s likely not what Nestle has in mind as such diverse agroforestry systems tend to require more investment of time and labor and yield diverse crops not the industrial stream of a single ingredient that they require. Not to provide financial support for Nestle’s proposed plantations. Not to fund robusta plantations through reforestation programs. To assess the environmental impact of developing Robusta plantations in Veracruz and surrounding states. To engage in dialogue with President Lopez-Obrador and the Secretary of Agriculture and Rural Development on their specific policy proposals for a stronger coffee sector that benefits the people of Mexico, not just massive multinational corporations. Let President AMLO know that the international community of coffee drinkers is concerned about small-scale farmers—sign the petition today. Who Profits from Your Coffee? Deals like this offer a concrete reminder of why we highlight the importance of knowing who owns the company you’re buying coffee from. While the marketing materials of some of Nestle’s more premium brands like Blue Bottle Coffee or Chameleon Cold Brew may highlight their farmer partners and sustainability initiatives, their parent company is investing far more resources in projects that are bad for coffee producers and the planet. (And this project is just one of many—Nestle routinely comes in near the top of lists of corporate abusers for human and labor rights, water rights, and environmental issues). If you’re looking to support small-scale coffee farmers, our list of mission-driven brands collects companies who are committed to working ethically throughout all their supply chains. Companies like Equal Exchange have been committed to working with small-scale farmers for more than three decades and others like Higher Grounds Coffee, Just Coffee, and Peace Coffee grew out of solidarity projects with Mexican coffee farmers. Take Action: Stand With Coffee Farmers! Oppose Nestle's Agribusiness Expansion! Only the already wealthy will benefit. Every country should be investing in ideas that help their own people, the land and local economy’s. Leave the small family farmer alone and let them live and work independently from the corporate complex. Buy their fair trade commodities and keep the big factory production out. A depressingly family story worldwide. Small growers, better coffee, better for the world. Nestle should be dissolved. Certain big corporations care only about one thing- profits. They will destroy the environment and people’s lives in doing so. We see such a situation in Mexico. They have no regard what so ever for the small family coffee growers. Big corporations care only about one thing- profits. They will do anything to make a buck even if it means destroying the environment and people’d lives. Nestle has been a common criminal complicit in crimes everywhere that they go…. Boycott every Nestle product and all of their subsidiaries and they will change their ways…. They only care about money…. I’ve been boycotting Nestle and all huge corporations for many many years! I pray that small farmers rule the world once again! = F*** Nestle!!!! Information is key to change. High yield $ right now thinking leaves out all small local farmer/producers. The only way to fight this kind of greed is to seek & support the small growers who steward the earth as they sustain income for their families and neighbors. We speak with our money, so supporting conscious businesses rather than only profit conscious corporates like Nestle is a dollar war worth fighting. Support and invest in small-scale farmers, diverse agroforestry systems, and fair livelihoods. Nestle will put profit over people and the environment. Nestle is equal to Monsanto in lack of regard for anything but money! These companies are ruining stupid America………. Don’t let the same thing happen in Mexico !!! Exactly. When Nestle’s in late 1980s couldn’t get an ultra whoopie product approved for sale in the U.S., they shipped the stuff off to peddle to countries in Africa~!! !